What do you get when you combine gorgeous weather, a world-class soccer stadium, and a PTC cooking competition? 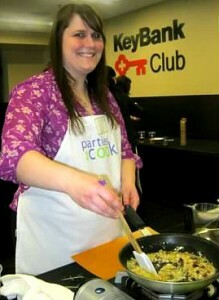 One awesome corporate cooking event! The event recap below was submitted by our Portland city manager, Carolyn. It’s been a while since our last guest post, so let’s just jump right in. We were very excited to host this corporate group from Yahoo! at one of our favorite Portland venues: Jeld-Wen Field, the stadium where our beloved Portland Timbers play. 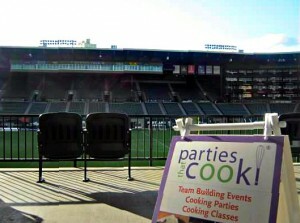 (Then again, how could you not love cooking with a view of the Timbers field?) We were lucky enough to have the sun shining brightly as PTC team members Chris, Lauren, and I set up in the Key Bank Club. Oh, the perks of being a completely mobile cooking party company. I love working in new venues, transforming event spaces into the perfect Parties That Cook “kitchen”. Have I mentioned that all we need is a sink?! Yahoo! guests arrived on schedule for an informative tour of Jeld-Wen Field. The tour ended at the Key Bank Club, where we welcomed everyone with an apron, name tag, beverages and antipasti platters. We kicked off the event with our favorite question: “When you’re at a party, where does everyone like to congregate?” Answer: “The Kitchen!! !” We gathered everyone around the same cooking station, and Lauren demonstrated a number of culinary tips and tricks that would help during the cooking — both at the event and at home. As soon as I explained how the competition works and covered key safety tips, the group was ready to cook! Yahoo! host, Kevin, had organized a Sumptuous Small Plates Challenge, so we knew we had a pretty competitive group on our hands. Kevin also told us that this event was meant to celebrate the team’s achievements — how fun! Despite being under the pressure of a timed competition, each team had a great time cooking together, adding their own creative twists to our recipes, and bonding over a hot stove. The group prepared a mouthwatering menu including Crostini of Smashed Cannellini Beans and Feta Salsa Verde, Hosomaki Spicy Tuna Spiral Rolls, and Chocolate Stout Cupcakes with Porter Frosting and Chocolate Bubbles – YUM! We chefs circulated to see how the teams were doing and give them further guidance along the way. After 60 minutes, we called for teams to present their plated creations. Each team picked a representative to tell us why their dish should win – in just 1 minute! After a few laughs and a few more theatrics, guests enjoyed the fruits of their labor, sampling each others’ dishes while the chefs tasted and judged the submissions. 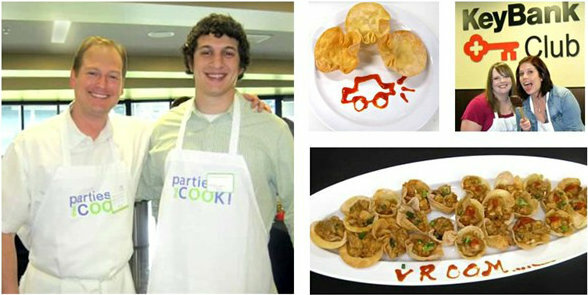 The winner was decided based on taste, presentation, creativity, and display of teamwork during the cooking. It was tough to make a decision, as usual, because all the food turned out great. We loved the creativity of the Sweet, Sour and Spicy Chicken in Won Ton Cups team, who used Sriracha sauce to draw a picture of a car and wrote “Vroom!” on their platter (a representation of their Auto team back at Yahoo!). It was the Mini Skewers of Roasted Lamb with Indian Makhani Dipping Sauce, however, who pulled ahead for first place! Congratulations!! They did a fantastic job cooking the lamb so it was still juicy. And the Makhani sauce they made was to die for! We chefs wanted more – how did they make it so good?? We awarded the winning team with bright green garlic grippers, and congratulated everyone on a job well-done. Guests continued to mingle, enjoying their food and drinks while listening to rad 80’s music and even watching the Timbers practice out on the field! Bonus!! We ended the day with a lovely group photo with the soccer field in the background. Thank you, Kevin, for a fun day with your Yahoo! team. 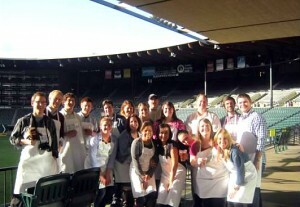 We hope to host your group again soon — and really hope it’s at Jeld-Wen Field!